The spa town of Warmbad, district of the mountain town Wolkenstein, welcomes you in beautiful surroundings at the heart of the central Ore Mountains. Since the discovery of the Warmbad spring in the 14th century, the spa town can look back on a turbulent history. Warmbad has become a modern health and wellness centre where day guests, health and wellness tourists as well as outpatient and inpatient spa guests can find peace, relaxation and recuperation. Warmbad welcomes you with a modern rehabilitation clinic, an idyllic spa park with lake and concert venue, a range of accommodation and the heart of the spa town - the Silber-Therme Warmbad. You can obtain information on spa stays, accommodation and wellness or health holidays in the spa town of Warmbad from spa and guest services at +49 (0)37369-15115. The thermal spring of Warmbad near Wolkenstein was discovered in the Middle Ages, probably during mining work. It is the oldest and warmest thermal spring in Saxony still in balneological use. In the following we would like to present the most important development stages and significant events of the thermal springs and spa town to you. The lords of Waldenburg take possession of the dominion of Wolkenstein. In a document, Unarg von Waldenburg promises the monastery Nimbschen near Grimma a tenth of the proceeds from his mines in the dominion of Wolkenstein - evidence that mining activity was already taking place at this time. The spring is presumed to have been discovered whilst mining for silver ore. The mine workings “Palmbaum” between Warmbad and Gehringswalde for instance belonged to the most important silver mines of the Wolkenstein-Marienberg mining district. The reference to the year 1385 shown in an altarpiece cannot be confirmed. At the behest of duke Heinrich (responsible for the districts Freiberg and Wolkenstein since 1505), several mine managers came to Warmbad to consult on stabilising the spring. Under Paul Salzberger, then a mining manager in Buchholz, the spring was stabilised, its water bed was lowered and the roof of the bath house was renovated. Elector August (son of duke Heinrich) instructed mine manager Martin Planer with improving the spring’s quality even further. As specialist for hydraulic engineering, Planer had a drain shaft constructed to drain away the cold surface water. This resulted in a noticeable increase of the spring temperature. Impoverished as a result of the tribulations of the Thirty Years’ War, the owner, Frauenstein priest Jacob Süss, sold Warmbad to Dr August Hauptmann and tax collector Heinrich Schrey. These made it their mission to help the bath flourish yet again. To protect the spring, the Saxon elector Johann Georg II. prohibited prospecting and mining within 150 Lachters (300 m) of the spring. 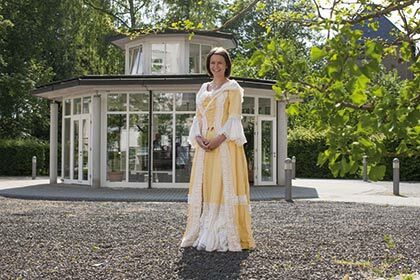 The Prince’s Bath constructed especially for electress Magdalena Sybilla next to the spring was inaugurated. A violent storm with heavy rainfall destroyed nearly all the buildings of Warmbad, including the Prince’s Bath. The first chemical analysis of Warmbad’s thermal therapeutic spring was performed in Dresden. Once the course for the restoration of the bath had finally been set, the new owner, cobalt inspector Johann Gottlieb Scheffler, commenced the repair work as soon as the purchase had been completed. It was possible to make the spring tunnel from the opening along its entire length of 192 1/8 Lachters (485 m) usable again and to restore it permanently. On the occasion of the planned health resort stay of the Saxon electress Maria Amalia Augusta, a new bath house was constructed and inaugurated, which was however destroyed partially in the same year by yet another storm. After being acquired by the Uhlig family, Warmbad became a spa town for the middle classes. By reframing the warm spring it was possible to divert the inflow of cold, “wild” water from the warm springs and, as a result, achieve a permanent temperature of 29°C. A new octagonal well house with a tented roof was constructed around the spring and an improved water lifting system was put in place. For the first time, Warmbad’s thermal water was bottled in one litre bottles as “Warmbader Sprudel” and made available for therapeutic home drinking regimes by mail order. After fluctuating success, mail order was abandoned in 1944. Warmbad obtained brewing rights as early as the 17th century and sold beer brewed with the spring water as a “medicinal drink”. At the start of the 20th century, when radon-containing water was presumed to have therapeutic effects, the radioactivity of Warmbad’s spring was also investigated. Professor Schiffner from the Bergakademie Freiberg determined a value of 3.2 Mache (ME) in his analysis. This unit, which was used at that time to indicate the Radon concentration in balneology, corresponds to 13.5 Becquerel/litre (Bq/l). The Akratotherme in Warmbad has low radioactivity. Ordinance no. 104 of the Kingdom of Saxony stipulated an approximately 300 m wide strip along the “Neugeboren-Kindlein- Flache” as a spring protection zone. Evidently this protection zone declaration was already influenced by insights into the origins of the spring. For instance, the “Neugeboren-Kindlein- Flache” was recognised as spring passage system and it was assumed that surface water flowed towards the spring. Professor Haupt from Bautzen performed the first precise analysis of the Warmbad mineral spring. Beginning of uranium ore mining in the former Marienberg mining district. These intensive mining activities in the nearby districts “Palmbaum”, “Himmelreich” and “Lauta” of the SAG Wismut, object 05, had a lasting negative effect on the thermal therapeutic spring. A temperature drop to 7.2 °C was the result. The thermal therapeutic spring and the spa facilities were taken over and turned into a convalescence resort for miners by SV Wismut. Extensive mining restoration works in the aforementioned districts by SDAG Wismut led to a gradual recovery of the thermal spring and an associated temperature increase. Further restoration measures, in particular safety works on various shafts of the aforementioned districts by VEB Bergsicherung Schneeberg, yet again decreased the quality risk to the thermal spring. Karl-Marx-Stadt district council passed a resolution for a new “Protective Zone Declaration for the Natural Remedies of Warmbad”. This protective zone resolution is still valid today. 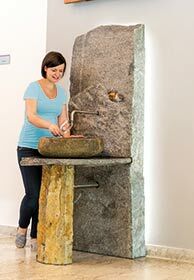 Takeover of the thermal therapeutic spring by the Kurgesellschaft Warmbad mbH. The Kurgesellschaft Warmbad mbH instigated extensive repairs of the drain shaft. Use of the residence until 2013 as spa park hotel “Brunnenfee”, since 2014 senior citizens’ supported living residence. Expansion of the Silber-Therme with the wellness area “Fountain of Youth”. Opening of the **** hotel and health resort “Santé Royale”. Opening of the drinking fountain in the foyer of the Silber-Therme. In addition to being awarded the quality mark “location with therapeutic spring spa facilities”, we may now call ourselves state-certified therapeutic spa. Expansion of the Silver-Therme with a rest area across two floors. Where is the thermal therapeutic water used? All pools of the Silber-Therme are filled with the thermal water. After your sauna visit you can also cool off with thermal water in the cold water pool or under the showers. The drinking treatment is mankind’s oldest healing treatment. As explained by the German Spas Association, it involves the consumption of therapeutic water over a longer period of time. The Association recommends such treatment twice to three times per year. The thermal water provides complementary treatment for osteoporosis, helps to flush through the urinary tract in the case of kidney and urinary tract diseases such as urinary stone diathesis and is beneficial for caries prophylaxis. The water should not be used in individuals with severe kidney diseases, pronounced cardiac insufficiency and pronounced oedema (soft tissue fluid retention). The therapeutic water must be drunk at the same time each day! Try our Warmbad thermal therapeutic water at the drinking fountain in the Silber-Therme’s foyer or in the drinking pavilion! The thermal therapeutic water bubbles from the new drinking fountain in the Silber-Therme’s foyer for all guests. 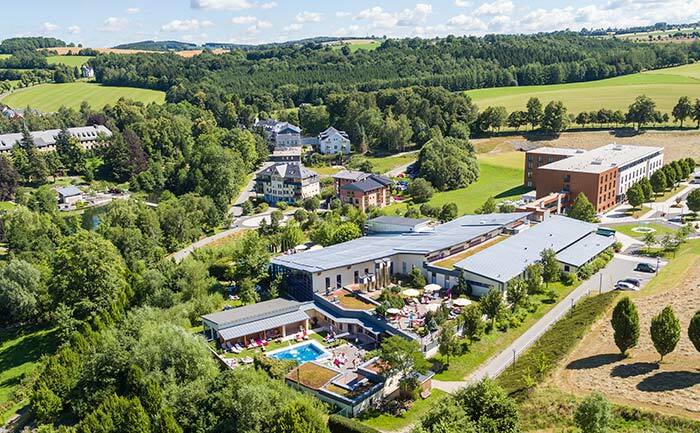 The fountain complex in Warmbad’s spa park invites you to partake in drinking treatments with the “state-certified therapeutic water” of Saxony’s oldest and warmest thermal therapeutic spring.